Additionally, the migration and proliferation of pancreatic cancer is also supported by CAFs expressing fibroblast activation proteins (FAP). Overexpression of FAP in tumor cells resulted in increased tumorigenicity and enhanced tumor progression [28, 29]; the enzymatic activity of FAP plays an essential role in FAP-driven tumor growth in a murine xenograft model, as evidenced by inhibition of FAP enzymatic activity being associated with tumor attenuation . As expected, higher levels of FAP expression in patients were associated with shorter overall survival compared with patients showing lower FAP expression, suggesting that FAP is important for tumor progression and metastasis in pancreatic cancer .Deletion of FAP gene and pharmacologic inhibition of FAP enzymatic activity reduced the tumor burden probably through disturbing stromagenesis, angiogenesis, and promotes nti-tumor immune responses. [32, 33, 34]. Administration of FAP-CAR T cells into tumor-bearing mice significantly reduced tumor growth and induced apoptosis of tumor cells . The degree of desmoplasia was found to be reduced in highly desmoplastic lung cancer xenografts, with a marked disruption of adenocarcinoma ductal-like structure of the tumor nodules, a decrease in collagen and fibronectin content, and an increase in necrosis in FAP-CAR T cell-treated tumors. This in turn promotes the recruitment of immune cells, consequently augmenting antitumor immunity . Similar results were observed in murine models of pancreatic cancer, where FAP-CAR T cells significantly inhibited the growth of non-immunogenic tumor [31, 32, 33, 34]. Depletion of FAP-expressing stromal cells resulted in a better immunological response and a lower tumor burden [29, 35],These findings may suggest therapeutics that selectively target FAP-expressing cells, but not other cancer-associated stromal cells, may result in a better prognosis. Pancreatic cancer has been recognized as one of the most aggressive malignancies and is usually diagnosed at an advanced level, with limited or no effective therapeutic options thus far. However, preclinical and clinical trials have shown promising results in therapies targeting immune checkpoint molecules. 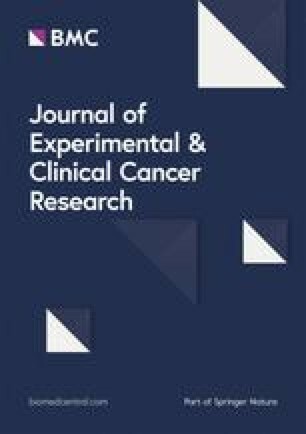 Of note, immune checkpoint therapies is largely ineffective in pancreatic cancer due to the low mutational load along with the hypoxic pancreatic TME that is filled with immunosuppressive cells, which acts as a selective barrier to drug penetration and infiltration of immune effector cells, significantly limiting the efficacy of immunotherapy. Many efforts have been made to gain insights into patients who exhibit resistance towards immune checkpoint therapy and to find ways to maximize treatment efficacy via combination therapies. 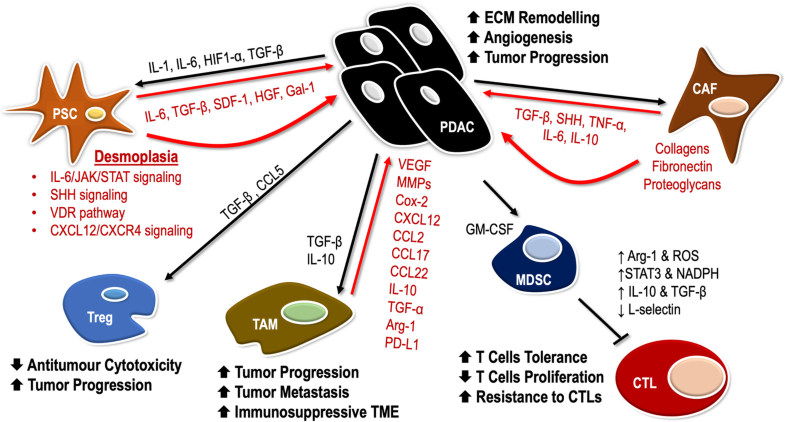 Rational combinations of immunotherapy may represent one potential strategy to synergistically overcome the immunosuppressive microenvironment of pancreatic cancer, as well as to induce long-lasting antitumor activity within the TME. The optimal dose, schedule, and ideal sequence, for example, when to combine immunotherapy with other therapies such as chemotherapy, radiation therapy, or targeted agents, must be determined, as these therapies have different mode of actions . In view of the increasing number of novel compounds being synthesized [181, 182] or isolated from natural products [183, 184, 185, 186, 187, 188, 189, 190], more pre-clinical studies are required to test whether these new classes of compounds can also target the tumor microenvironment of pancreatic cancer. These new compounds may act synergistically with chemotherapy, radiation therapy, immunotherapy or other targeted therapies.